What is your favorite medium to use, and why? My favorite medium to work with is mixed media, or collage. I enjoy working with paper and found imagery, and creating work that carries deep, personal meaning through the use of simple text, or images. Sometimes, I refer to my technique as "painting with paper". 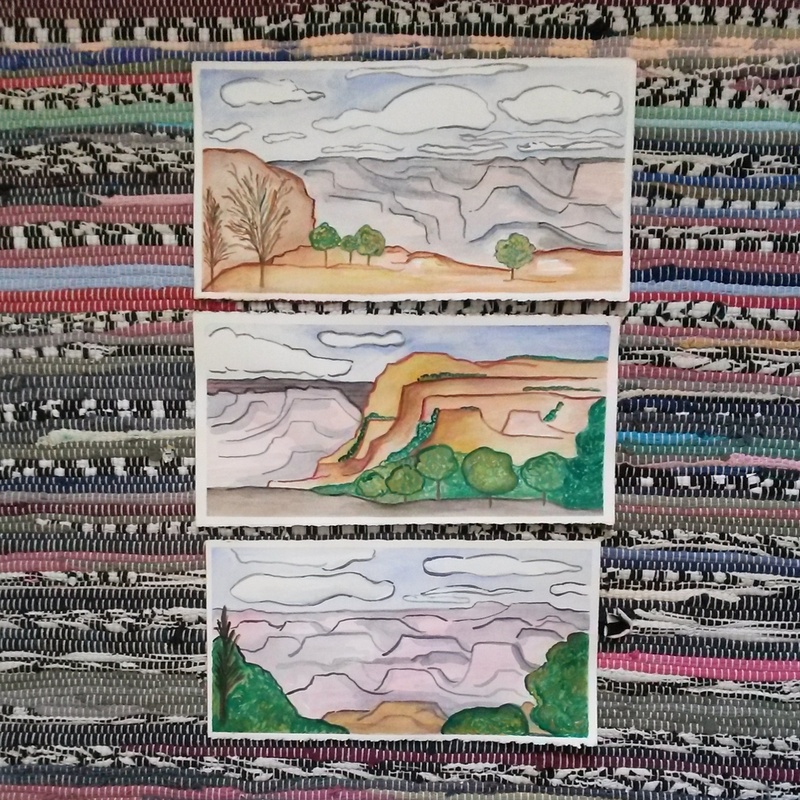 I also enjoy painting and recently began working primarily with watercolor. Why do think that art matters? Art is the universal language that all humans can understand. It knows no boundaries. It is important for all people to be exposed to the possibilities that art holds for communication and self-discovery. Creating art goes beyond "knowing how to draw". There are so many ways to express oneself through art. One of my constant goals is to allow students of all ages to understand that, and not to be afraid to try. I am very much a lover of art history, and most of my teaching is inspired by specific artists and movements. I have many favorites, including Henri Matisse, Pablo Picasso, Wassily Kandinsky, Stuart Davis, Georgia O'Keeffe, Robert Rauchenburg, Paul Klee, Alexander Calder, Joan Miro, Mark Rothko, and Robert Motherwell, to name just a few. Abstraction and Expressionism are two movements that continue to resonate within me and influence my own work and my teaching. When I first graduated from college (quite a few years ago), my very first job was at the Philadelphia Museum of Art. It was there that I really started to grow in my interest in art history, and the feeling of being surrounded by the work of world renowned artists was incredible. It is still my favorite place to visit. They have amazing retrospective exhibitions and many wonderful programs that extend into the community. What is your favorite art related quote? "Creativity takes courage," by Henri Matisse. So simple, yet so strong. Creativity and being an artist does take courage. Whether you are born with natural talent, or simply have the desire to learn, being able to stand apart and discover your own personal artistic strengths and ideas takes a great amount of self discipline, and reflection. What made you first become interested in making art? I first became interested in art when I was about 3 or 4 years old. My favorite activities were coloring and drawing. It was something my parents encouraged and supported me to keep doing. I did not have any art classes in my elementary school, so I went to classes at colleges and recreation centers, similar to the youth studios at PCA&D, to learn art. What is your first art related memory? My first art related memory is from when I was about 4 or 5 years old. Instead of watching cartoons, I would sit and watch "Bob Ross, the Joy of Painting" on PBS for hours and hours at a time. I can truly say that he was my first teacher. My parents bought me an easel and real acrylic paints in all the colors Bob would use, such as Yellow Ocher, Titanium White, and Alizerian Crimson. I also had professional brushes! I would go down to my studio in the basement, and put on my smock, and paint after watching Bob Ross. My parents still have some of my landscape paintings from that time. I treasure the fact that Bob Ross was there on the TV to inspire me at such an early age. Creativity is simply one's desire to make something. It could be a mark on the paper, or the snap of a camera, or the the strum of a guitar, or the funky dance moves in the kitchen. Being creative just means that you have something inside that wants to be expressed. I believe we all have that, its what separates us from most other living creatures. Learning to fully embrace that desire to be expressive is what makes someone an artist. Teaching has become my absolute passion. I teach art so that I can bring the joy of creativity and expression into the lives of my students. I teach my students how to feel free, not afraid, experimental, and not to have cautiousness when it comes to art. The reward of seeing the work that they can produce, because of my teaching and guidance, is just extraordinary. I see a little bit of myself in each of them, and it makes me very proud to watch them grow as young artists.